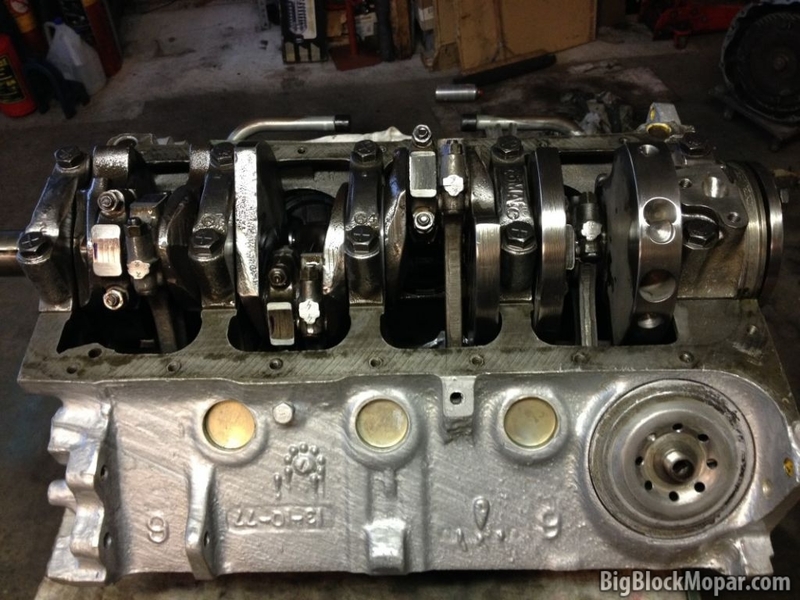 Here are some pics and info about the 360ci engine I recently put together. 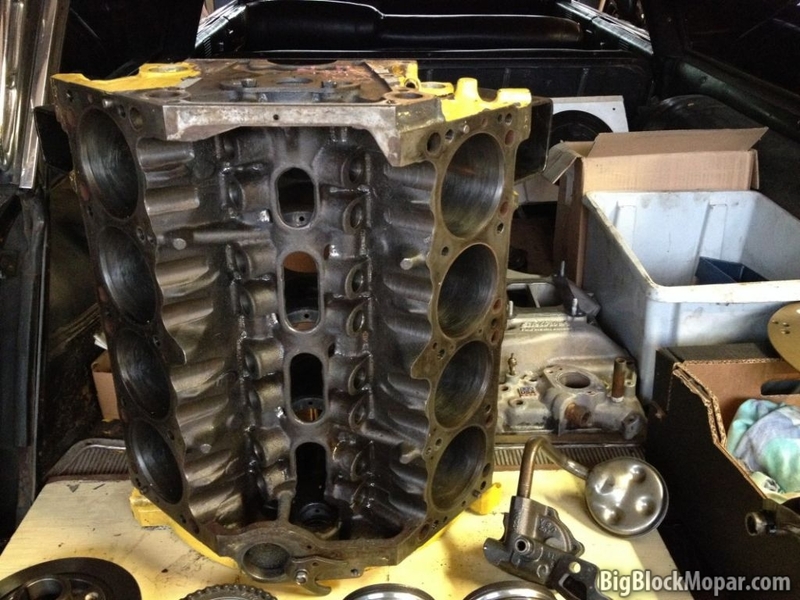 The engine will a replacement for the stockish 318ci in my daily driven propane-powered '73 Dodge Dart. The 318 has a wimpy 8.6:1 compression ratio. Not bad for put-putting around and while I managed to get some decent power out of it, it's still no tyre-frier. 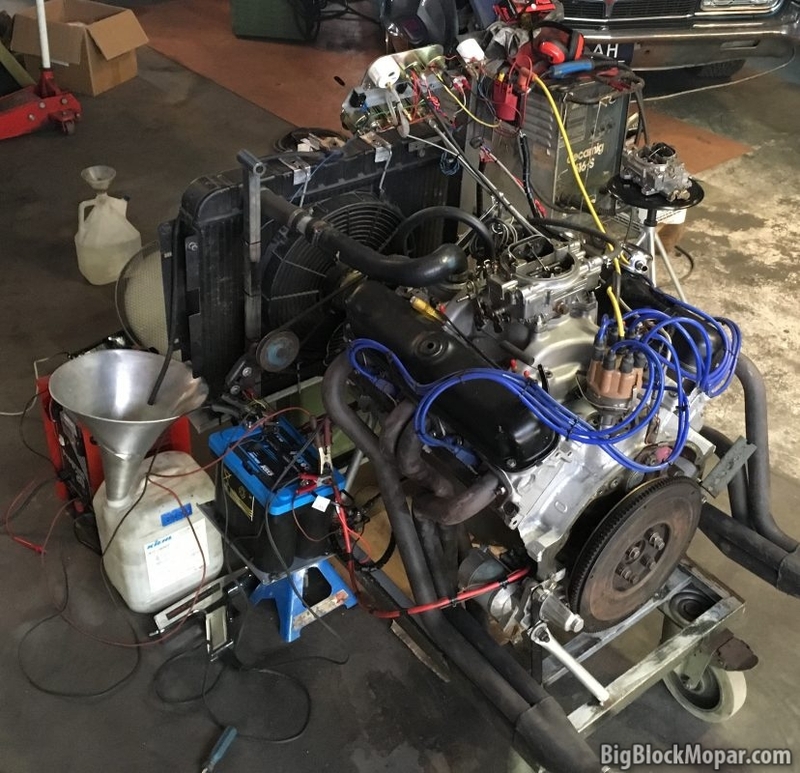 Goal with the freshly build 360 is to increase torque, efficiency and hopefully as a result, fuel-economy as well, as the current setup only gets me 10-12mpg. The 360 had been run shortly before I bought it, but a scored bearing & crank issue made it seize up for the previous owner. I rebuilt the engine with new bearings, new cam and located a freshly located .010" crankshaft. – Iron heads, ‘302’ casting (closed chamber). milled to get 60-61cc chambers. – Valves have been backcut and polished. – Smoothed/polished Edelbrock Performer intake, w/ blocked heatriser ports. – Tight piston-to-head quench-clearance of 0.025-0.030″. 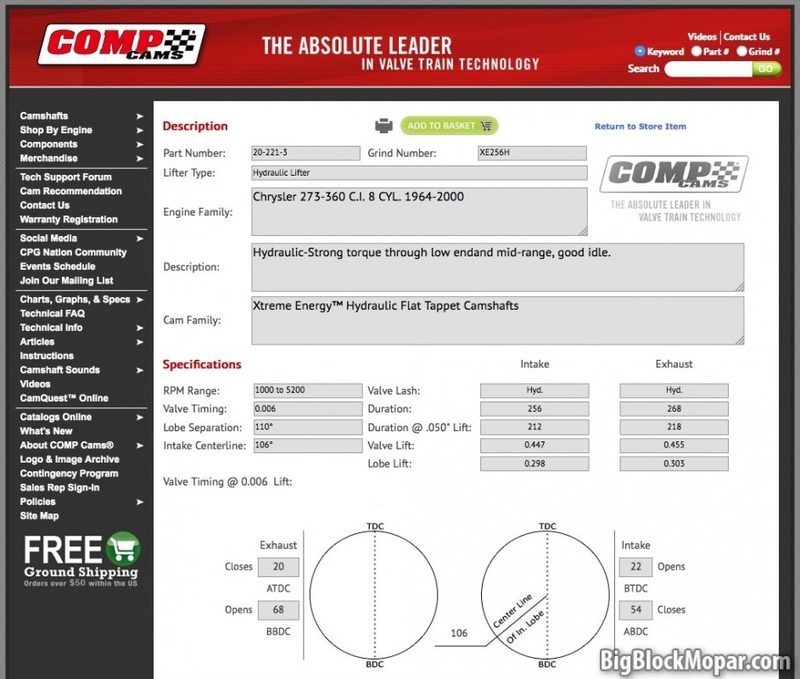 – CompCams Extreme Energy XE256H, used with 1.6 ratio rockers. During the build I found the KB-piston ring gaps where too tight, so I corrected them to .0025". - modified/installed windage tray from other 360 engine. - improved oil-transition channel between rear main-cap and oilpump. - milled heads to 60cc head chamber. 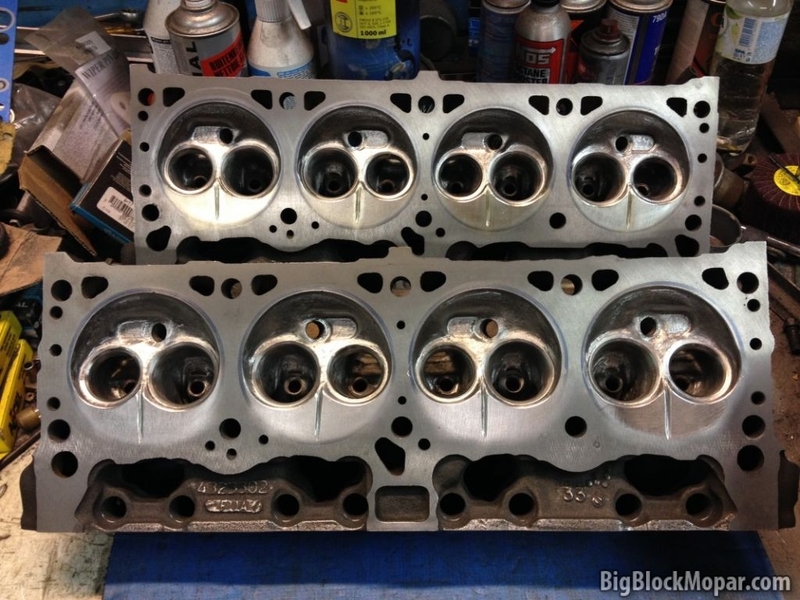 The Mopar '302' heads are the Mopar '302'-casting swirl-port heads. I gasketmatched and smoothed the runners and polished the chambers, along with some minor contouring of the swirl area. The camshaft is a CompCams XE256H. 256° In / 268° Ex dur. @ .050"
With 1.6 rockers this will give resp. .4768/.4848" lift. With the 11.3cr, this will give a DCR of 8.6:1. To break-in the new cam I decided to built an engine-stand as well. Something I wanted to do a long time ago already, but it finally happened. 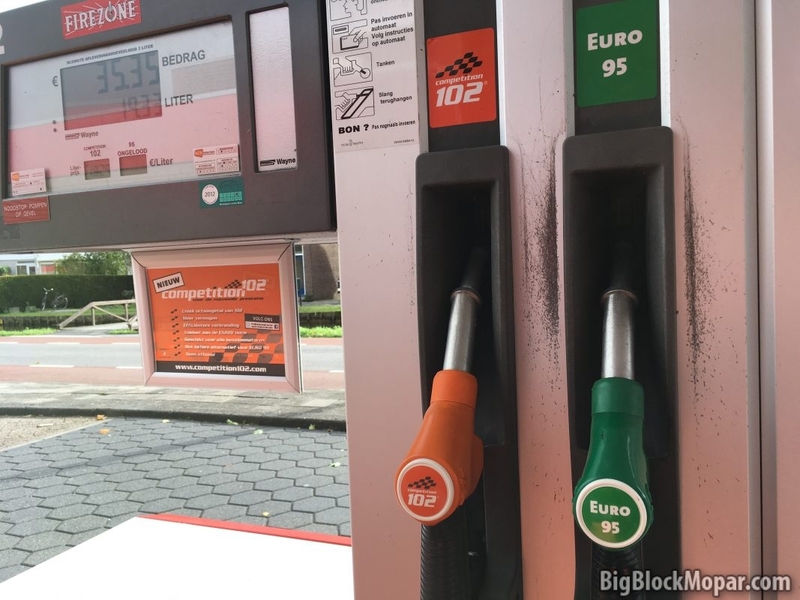 At the day of the engine's first start-up, I bought 5 gallon of 102 octane pumpgas to prevent any form of detonation. So I had to stop and go ahead with the break-in after a short cool down period. After running the engine with a different carb and distributor with quicker timing curve the engine ran pretty cool. There are some typo's in my first post (Where the edit-button?). Cam duration posted ofcourse isn't at 0.050 but "Advertised". The at 050" values are 212 IN / 218 EX. Also the piston ringgap is off by a decimal. It's supposed to be .025". I posted the topic here in Show&Tell but maybe it would be better off in the Engine Tech-forum? Yes I think this the correct place to put your thread, unlike me who put their engine build thread in the tech section! Glad to see you are accomplishing your plan. I'm betting this will significantly outperform the near stock 318 and your exhaust system will work better with this engine. Thanks. Thought about having this topic deleted and start a new one because unfortunatly there's another error in my first post. With the 11.3cr, this will give a DCR of 8.6:1. - Should be DCR of 9.6:1 - The output of the KB DCR-calculator was wrong because of me feeding a wrong number into it. The Wallace calculator made that clear to me.